One of the most inspirational figures in history; this man went through the worst you could imagine and then led a country steeped in tradition to change the impossible. Nelson Mandela is one of my heroes. What he did was almost super human. Surely the Creator prepared this man for the role he would play in history. Not only did he change the world, he did it after serving 27 years in prison. Some of the key attributes, that pinned the foundation of his life, were love, patience and courage. This truly was a man for the centuries. In this short six-minute video, we pay tribute to Nelson Mandela who passed away December 5, 2013. Because of him, the world will forever be a changed place. May we have more tolerance, more hope and more love as we remember Nelson Mandela. 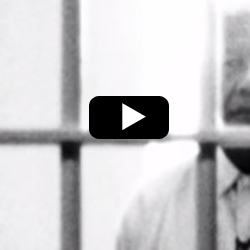 This inspiring video on Nelson Mandela was published on Youtube on January 28, 2010. It was created by the people at bio who believe that "the truth is more entertaining than fiction". Learn more about Nelson Mandela on Wikipedia. If you want something a little different, mosey on over to our Christian movies page which features some of the best inspirational videos found on YouTube.